Jess Fishlock’s header goal in the 48th minute pushed Seattle Reign FC over Utah Royals FC 1-0 in Week 20 action in hot, smoky weather at Rio Tinto Stadium on Saturday. The Reign picked up three points on the road to improve to 10-4-6 (36 pts) and stay secure in second place in the standings. Following the end of Week 20’s results, the Reign are four points clear of the third-place Thorns. Utah Royals FC drop to 7-7-7 (28 pts) and are in sixth place with the loss. The Reign snapped their four-game winless streak on the road, while Utah picked up their first loss in their last three games. Fishlock’s goal was her first of the season. She has now scored in every NWSL season, becoming the third Reign FC player to accomplish the feat. Her teammates Allie Long and Megan Rapinoe have also scored in every NWSL season. The Reign had a corner kick in the 46th minute, which was taken by Megan Rapinoe. Rapinoe played it short to Fishlock, who was checking towards her. Fishlock laid it off to Rapinoe, who served it in — the ball eventually bouncing out into the stride of Reign defender Megan Oyster. 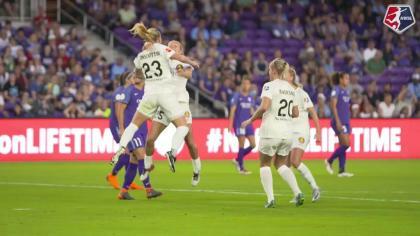 Oyster served the ball into the box — where Fishlock headed it home near post and past Utah Royals FC goalkeeper Abby Smith. Fishlock finished the match with two shots, both on target and one key pass. Rapinoe had a team-best four shots on the night, and remains in second place in the league for shots with 61. The forward has scored seven goals and five assists this season. Seattle tested Utah early in the match, forcing Smith to come up with two big saves early. In the 10th minute, Morgan Andrews won the ball in the midfield and it was picked up by Fishlock, who played Rapinoe into space. Rapinoe got a shot off near post, but Smith made a diving stop to keep the game scoreless. In the 16th minute, it was combination play between Fishlock, Rapinoe and forward Jodie Taylor that set up Rapinoe from a shot from a distance. Rapinoe struck it with her right foot towards the near post, but Smith collected it once again. Just before the half, Utah defender Katie Bowen won the ball from Fishlock in the box and Utah caught Seattle on a quick transition springing forward Christen Press into space down the left flank. Press got the ball and dribbled towards the center of the field, where she took a shot at the top of the circle. Her strike was collected by Lydia Williams. Press finished the match with three shots. After Fishlock’s goal, Utah Royals FC were not going to let another one through. Center back Becky Sauerbrunn made three clearances, one interception and gained possession for her team eleven times. Smith made five saves in the loss, while Williams earned two saves for her eighth shutout of the season. Utah’s best chance was sparked by Press in the 93rd minute, when a ball served by Sauerbrunn brushed over the top of Oyster’s head into the path of Press. Press took a touch with her right foot across her body to her left, but her shot went near post into the hands of Williams. The Reign return to action at home on Wednesday vs. the Chicago Red Stars and Utah Royals FC hit the road on Saturday to visit Sky Blue FC. Match ends, Utah Royals 0, Seattle Reign 1. Second Half ends, Utah Royals 0, Seattle Reign 1. 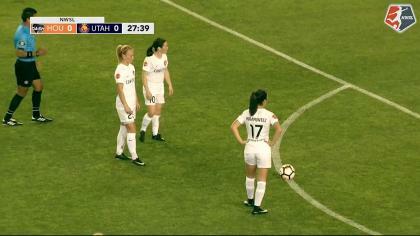 Katie Stengel (Utah Royals) wins a free kick on the left wing. Attempt missed. Christen Press (Utah Royals) left footed shot from the left side of the box is close, but misses to the left. Rebecca Moros (Utah Royals) is shown the yellow card. Megan Rapinoe (Seattle Reign) wins a free kick on the right wing. Substitution, Seattle Reign. Adriana Leon replaces Jasmyne Spencer. Kristen McNabb (Seattle Reign) wins a free kick in the defensive half. Attempt missed. Gunnhildur Yrsa Jonsdottir (Utah Royals) header from the centre of the box is too high. Assisted by Katie Bowen with a cross following a corner. Substitution, Seattle Reign. Kristen McNabb replaces Morgan Andrews. Jessica Fishlock (Seattle Reign) is shown the yellow card for a bad foul. Substitution, Utah Royals. Amy Rodriguez replaces Taylor Lytle. Delay in match (Seattle Reign). Attempt saved. Diana Matheson (Utah Royals) header from the centre of the box is saved in the bottom left corner. Assisted by Christen Press with a cross. Attempt missed. Megan Rapinoe (Seattle Reign) right footed shot from outside the box misses to the left. Assisted by Morgan Andrews. Corner, Seattle Reign. Conceded by Rebecca Moros. Substitution, Utah Royals. Desiree Scott replaces Katrina-Lee Gorry. Attempt missed. Lauren Barnes (Seattle Reign) left footed shot from outside the box is just a bit too high. Attempt saved. Jessica Fishlock (Seattle Reign) right footed shot from more than 40 yards on the right wing is saved in the bottom right corner. Assisted by Megan Rapinoe. Attempt saved. Jasmyne Spencer (Seattle Reign) right footed shot from the centre of the box is saved in the bottom left corner. Attempt missed. Gunnhildur Yrsa Jonsdottir (Utah Royals) right footed shot from outside the box is too high. Assisted by Katrina-Lee Gorry. Goal! Utah Royals 0, Seattle Reign 1. Jessica Fishlock (Seattle Reign) header from very close range to the top left corner. Assisted by Megan Oyster with a cross following a corner. Corner, Seattle Reign. Conceded by Becky Sauerbrunn. Attempt saved. Jasmyne Spencer (Seattle Reign) left footed shot from the right side of the box is saved in the bottom right corner. Assisted by Megan Rapinoe. Attempt missed. Christen Press (Utah Royals) left footed shot from the right side of the box is too high. Assisted by Gunnhildur Yrsa Jonsdottir. Attempt saved. Christen Press (Utah Royals) right footed shot from outside the box is saved in the bottom left corner. Assisted by Rachel Corsie. Offside, Seattle Reign. Jessica Fishlock tries a through ball, but Jasmyne Spencer is caught offside. Attempt missed. Jodie Taylor (Seattle Reign) left footed shot from outside the box is close, but misses to the left. Assisted by Jasmyne Spencer. Attempt missed. Megan Rapinoe (Seattle Reign) left footed shot from outside the box is just a bit too high. Assisted by Morgan Andrews. Attempt saved. Megan Rapinoe (Seattle Reign) right footed shot from outside the box is saved in the bottom left corner. Assisted by Jodie Taylor. Offside, Seattle Reign. Lauren Barnes tries a through ball, but Allie Long is caught offside. Attempt saved. Megan Rapinoe (Seattle Reign) left footed shot from the left side of the box is saved in the bottom left corner. Assisted by Jessica Fishlock.